Some of the most Under and Overrated Foods! My younger sister is currently attending culinary arts school at the Art Institute and she is presently in a cake decorating class. This is ultimately what she wants to do is have a wedding cake decorating business and I think she would be fantastic. Recently she has sent me a couple of pictures of cakes she has made and I am just amazed! So this got my mind thinking about making cakes and my love for beautiful fondant cakes. 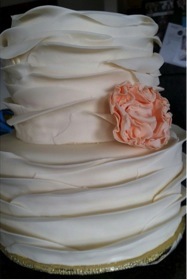 That is what I had for my wedding cake and it was so beautiful! The possibilities are just endless! They can be really extravagant, like something you'd see on Cake Boss, or even a simple, smooth white wedding cake can be just absolutely stunning. Making a fondant cake always seemed rather intimidating to me though. 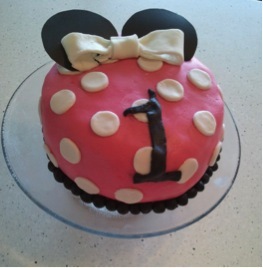 While I am not my sister or an expert cake decorator, for my daughter's first birthday a couple years ago I decided to take the plunge and make a really fun Minnie Mouse cake and I loved it! It turned out so cute and I thought it was so fun to make and easier than I thought. So if I can do it, anyone could do it! :) I used a marshmallow fondant recipe from the Wilton cake experts themselves, which was pretty tasty, despite fondant's usual bad reputation for tasting kind of gross. Since most people do not usually love the taste of fondant, often times the "cake" is not even cake. My sister told me that most times (especially for her practice cakes she does in school) she uses Rice Krispie treats and forms them into the shape of the layer of cake and uses that instead. I have learned that often times the only real cake part is the bottom layer the bride and groom take their bites out of and the rest is Rice Krispies treats or even foam! And nobody would ever know :) I am considering doing this for my daughter's next birthday. She is very much into Disney princesses right now so I think I might make a fondant cake for her in the theme of whatever princess is her favorite at the time out of the Rice Krispies and then have cupcakes on the side for friends and family. I hope you decide to take the plunge and try a fondant cake for your next special event or birthday cake you make. You won't regret it! About 2 pounds marshmallow fondant. 1. To make marshmallow fondant, place marshmallows and 2 tablespoons of water in a microwave-safe bowl. Microwave 30 seconds on high; stir until mixed well. Continue microwaving 30 seconds more; stir again. Continue until melted (about 2 1/2 minutes). 2. Place 3/4 of the confectioners' sugar on top of the melted marshmallow mixture. Fold sugar into marshmallow mixture. Flavoring can be added at this point if desired. Place solid vegetable shortening in easily accessed bowl so you can reach into it with fingers as you are working. Grease hands and counter GENEROUSLY; turn marshmallow mixture onto counter. Start kneading like you would dough. Continue kneading, adding additional confectioners' sugar and re-greasing hands and counter so the fondant doesn't stick. If the marshmallow fondant is tearing easily, it is too dry; add water (about 1/2 tablespoon at a time) kneading until fondant forms a firm, smooth elastic ball that will stretch without tearing, about 8 minutes. 3. It's best to allow Marshmallow Fondant to sit, double-wrapped, overnight. Prepare the fondant for storing by coating with a thin layer of solid vegetable shortening, wrap in plastic wrap and then place in resealable bag. Squeeze out as much air as possible. Marshmallow Fondant will keep well in refrigerator for several weeks. 4. 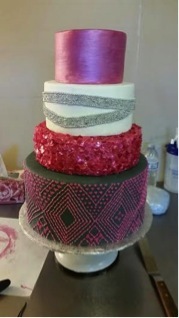 When not working with fondant, make sure to keep it covered with plastic wrap or in a bag to prevent it from drying out. When ready to use, knead fondant until smooth. Roll out fondant 1/8 in. thick. 5. To color fondant: If you need to tint the entire batch of fondant, add a little icing color to the melted marshmallow mixture before adding confectioners' sugar. For smaller amounts of tinted fondant, add icing color to portions of fondant as needed.